The Bible is approximately 11" x 9" x 3" and has suffered water damage. The Bible is H. & E. Phinney's Stereotype Edition, printed in 1829 at Cooperstown, New York. A few of the pages are detached but present; there may be some pages that are missing. The difference in the photographs results from the use of a scanner for the detached pages and outdoor photographs for the others, which have a gray appearance. 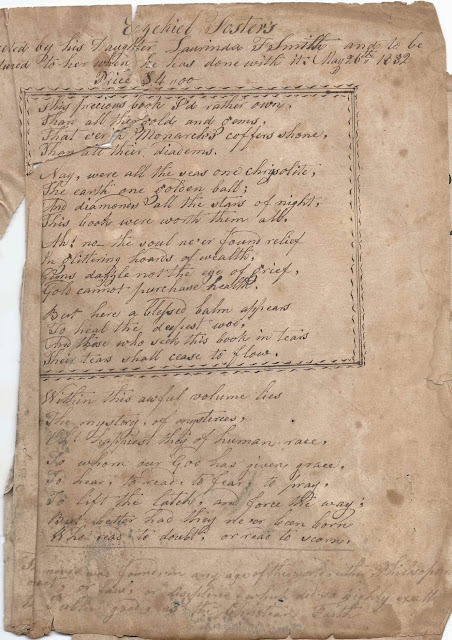 The Bible has four pages of Family Records plus other handwritten entries, including a page of handwriting describing Sally (Smith) Foster's tombstone. The Bible was presented to Ezekiel Foster by his daughter Laurinda (Foster) Smith, with the provision that it be passed on to her. The poem describes the worth of the Bible as greater than gold or gems; the worth of a Family Bible to descendants is also priceless. See more information on Ezekiel Foster and his descendants here. Researching online for Ebenezer and Sarah (Dean) Smith, I found several online trees that gives different dates of birth and place of birth for Ebenezer. Many trees give his birthdate as June 22, 1746. The Bible, however, definitely shows Jan'y 22, 1846, but I can't be sure that the person who wrote that entry in the Bible was correct. If you have corrections to the information above (in case the person making the entries was recalling in error or I erred in transcribing) or if you can share information on these families, please leave a comment or contact me directly.